2013 Investment Themes - John Mauldin's Outside the Box - Investment Strategies, Analysis & Intelligence for Seasoned Investors. A year ago, Dr. Gary Shilling published the influential book The Age of Deleveraging, which followed his earlier work, Deflation (1998); and in today’s Outside the Box he updates us on his thinking. Deleveraging of the financial and household sectors has created a terrific macroeconomic undertow since 2008, eroding growth. Gary argues (against many of the talking heads in the mainstream TV world) that the deleveraging process for both these sectors has several years to run before it returns them to the long-term trend. He notes that QE is having only temporary and limited impact, as each round of easing by the Fed has propped up stocks only until a crisis in Europe or the US undermines incipient recovery all over again. Now, this period of prolonged economic pain is giving way to competitive devaluations, as the major powers scramble to maintain a currency edge on their competitors. The upshot is what Gary terms the “Grand Disconnect” between sluggish global economies and surging equities, driven by never-ending monetary and fiscal stimulus; and it is, as he says, profoundly unhealthy. Of course, there is that slim, remote, inconsequential, trivial probability that our forecast of global deleveraging, of continuing global economic weakness and of recession is dead wrong, and that all the government stimuli and other forces will revive economies enough to justify current investor enthusiasm. We doubt it, however. What is an investor to do, caught up in a not-so-slow-motion landslide like this? Gary gives us a “risk-on” list; but he emphasizes that it’s temporary, because the Grand Disconnect is unsustainable – the next significant macroeconomic shock could plunge us right into risk-off mode, and we must be nimble, lest the Grand Reconnect catch us unawares. Note the contrast, by the way, between this week’s OTB and the one penned last week by Christian Menegatti. The fact that I can’t and won’t just lay easy answers in your lap should tell you not only something about Outside the Box but also about the necessity for heightened awareness and deepened analysis as we move into this crucial year. Outside the Box readers can subscribe to Gary Shilling's Insight for the special introductory rate of $300 via email. You'll receive a free copy of the January 2013 Insight, detailing all of their 2013 investment themes, and then you'll receive 12 additional months of Insight, starting with the February 2013 report. To subscribe, you can call them at 1-888-346-7444 begin_of_the_skype_highlighting 1-888-346-7444 end_of_the_skype_highlighting or 973-467-0070 begin_of_the_skype_highlighting 973-467-0070 end_of_the_skype_highlighting, or email [email protected]. One curious note. I am neither a market timer nor the son of a market timer, but I know a lot of these guys. And many whom I pay attention to are flashing major warning signals this week. If I were long this market, I would lay in hedges on what I did not want to sell and put in tight stops on the rest. Maybe a correction will be a rest stop on the way to higher numbers. Short term, emotions can drive markets to what, in retrospect a few years later, seems an obvious extreme, either to the upside or downside. I am sitting in my office on board an American flight back to Dallas from Vegas, where I spoke to a distressed-debt group (the rather large Turnaround Management Association). As usual, I learned more than I probably imparted. Once again, distressed-debt strategies were the top-performing hedge fund style last year. Deeply contrarian, buying what no one else wants and with full knowledge of problems, these guys (and a number of ladies) are a very interesting group of people. My good friend and partner Darrell Cain also happened to be in Las Vegas at another conference. After a marvelous dinner over which we discussed markets and our shared, lifelong love of science fiction, he took me to his favorite Las Vegas show, the Cirque du Soleil production called Love, featuring the music of the Beatles. I have been to four of the Cirque du Soleil shows and enjoy them for the high-quality entertainment they are. Darrell has been a half a dozen times to Love. It is very rare for me to repeat a movie, show, or book; so I was curious to see what could make someone want to go back again and again. It is unlike any of the other shows I have seen. It is three-dimensional ballet that assaults your senses from the very opening moment. The music has been remastered to create one of the finest auditory experiences I have ever had. The Beatles produced a body of work broader, deeper, and more diverse than that of any other group; and it’s one that a truly impactful show could be developed around with just a fraction of their repertoire. The show was emotionally overwhelming. It took me back to the ‘60s and my youth, telling the story of my generation by means of a visual and auditory extravaganza that simply could not be absorbed in one sitting or from one seat. While 20- and 30-somethings could appreciate the beauty, I doubt they got many of the cultural references that the artist who designed the show wove into the panorama with such effect. The Beatles were such a break with everything that went before and after. Kind of like the credit crisis of 2008. Except that I will see Love again and hope to the gods I never see another credit crisis. It would be fun to hold an event in Vegas and go and see the show as a group. The investment scene here and abroad is now dominated by the deleveraging of private economic sectors and financial institutions, the monetary and fiscal responses to the resulting slow economic growth and financial risks, and the fixation of investors on monetary ease to the exclusion of weak real economic activity. Chart 1 sums up the deleveraging issues neatly. It shows the cumulative net outside financing of the five major U.S. economic sectors, all in relation to GDP. The Financial and Nonfinancial Corporate sectors issue debt and equity, but the Household and the two Government sectors, of course, only issue debt. Chart 1 reveals four important developments. First, the Financial sector started its immense leveraging up in the 1970s as debt-to-equity ratios of some financial institutions leaped from 20 to 40. The Household sector followed in the early 1980s. That’s when credit card debt jumped and mortgage downpayments dropped from 20% to 10% to zero and even negative numbers at the height of the housing boom as home improvement (“piggyback”) loans added to conventional mortgages pushed debt-to-equity ratios over 100%. Second, the deleveraging process for both these sectors has commenced, but third, it has a long way to go to return to the long-run flat trends – and we are strong believers in reversions to well-established trend. If we simply extend the downward slopes, it will take the Financial sector 9.5 more years to return to trend as bank assets continue to be dumped and capital raised, and 8.3 more years for the Household sector as debts are repaid or written off and assets are rebuilt through a rising saving rate. We continue to suggest about five more years of deleveraging, however, since adding that to the 2008-2012 initial span would bring the total to about 10 years. 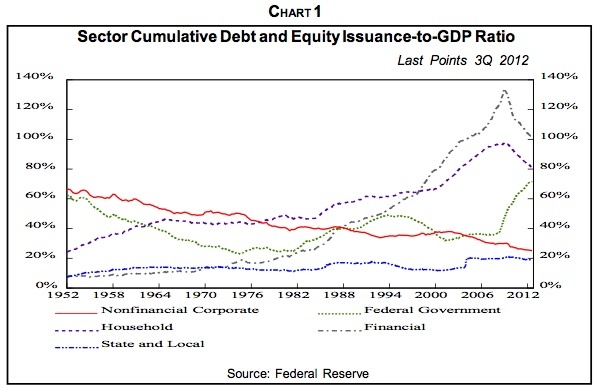 That’s the normal length of deleveraging after major financial bubbles. The fourth conclusion from Chart 1 is that the power of private sector deleveraging is gigantic. Witness the fact that despite all the fiscal and monetary stimuli here and abroad since 2008, economic growth remains slow at best. With frozen fiscal policies here and a number of foreign lands, responsibility to “do something” to aid the economy has shifted to central banks. Earlier, they pushed the short-term rates they control to close to zero with little effect. Then they turned to quantitative easing, which pumped up financial assets but did little to promote employment, its stated goal. QE is having only temporary and limited impacts. Notice in Chart 2 that each round by the Fed has been accompanied by a jump in stocks that only lasted until a crisis in Europe or the U.S. swamped it. Note that the Bank of Japan, which pioneered QE years ago, has not seen outstanding success. Japanese M2 money supply has been growing at about a 3% annual rate for the last two decades, but still, that economy has seen deflation more times than not in those years. In periods of prolonged economic pain, notably the 2007-2009 global Great Recession and distinctly subpar revival that has followed, international cooperation suffers in favor of an every-nation-for-itself attitude. Protectionism is the economic policy manifestation of this attitude, and a number of countries are now pursuing competitive devaluations in order to spur exports via a cheaper currency and retard imports. Of course, when all nations competitively devalue, none win and all lose as foreign trade is disrupted and economic growth depressed. But that doesn't stop countries from trying to get the currency edge on their competitors. Bank of England Governor Mervyn King worries that currency devaluations may become the new policy tool of choice to spur national growth now that central bank rates are close to their zero lower limits and quantitative easings are experiencing diminishing returns and risking market disruptions when they are announced. When a country wants to knock down its own currency, it can create and sell unlimited quantities in return for other currencies. In contrast, if it wants to support its own money, it needs to sell the limited quantities of other currencies it holds or can borrow from other central banks. So, depressing a currency is much easier than supporting it. And central bank policies to stimulate with low interest rates and QE may not be intended to depress those currencies, but have that effect by flooding the markets with dollars, euros, pounds and yen while low interest rates discourage foreign investors from buying those currencies. 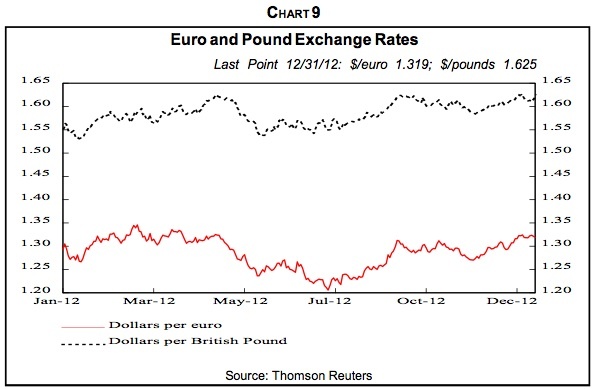 Of course, competitive foreign exchange devaluations always pit one currency against others. Since competitors probably retaliate, no country wins and all lose because of the disruptive effects on foreign trade, as noted earlier. This model is valid if all currencies are essentially on the same footing, but not if one, specifically the U.S. dollar, dominates as the primary international trading and reserve currency, its position since World War II. In our October 2012 Insight, we analyzed in depth the Grand Disconnect between the economies around the world, which are growing anemically at best, and investors who couldn’t care less as long as central banks are shoveling liquidity out their doors. “Don’t fight the Fed” is the rallying cry, especially among congenital equity bulls. And in 2012, at least the latter part, they got their wishes. Virtually every major stock market rose – in the U.S., U.K., the Continent and Japan, in China, Australia, Canada and even woeful Greece. Nevertheless, the Grand Disconnect between sluggish global economies and robust equities, driven by never-ending monetary and fiscal stimuli, is profoundly unhealthy – and a reconnection is inevitable. Of course, there is that slim, remote, inconsequential, trivial probability that our forecast of global deleveraging, of continuing global economic weakness and of recession is dead wrong, and that all the government stimuli and other forces will revive economies enough to justify current investor enthusiasm. We doubt it, however. The distortions caused by record low interest rates are numerous. At a zero federal funds rate, the Fed can’t cut it further in reaction to economic weakness. If deflation unfolds, it can’t push real rates negative in order to stimulate borrowing. That’s the problem in deflationary Japan. Furthermore, the lack of response to near-zero interest rates by lenders and borrowers is what pushed the Fed and the Bank of England and, starting earlier, the Bank of Japan into the new world of quantitative easing. This and other non-interest rate actions taken previously also has moved the Fed uncomfortably close to fiscal policy and threaten its independence. The federal government, of course, isn’t the only borrower benefiting from low interest costs and negative real rates. Residential mortgagors, if they can qualify for loans, obviously are getting a break with 30-year rates at 3.37%. 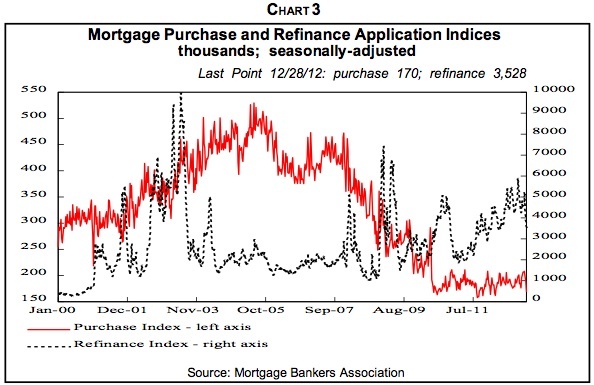 Applications for refinancing home mortgages are leaping (Chart 3) as those who aren’t underwater and can otherwise qualify jump at lower mortgage rates. Investment-grade corporations have been able to issue debt and refinance at low rates, and many are doing so. Low interest rates have also encouraged the issuance of below-investment grade junk bonds, and numerous companies have, in effect, pre-refunded their debt. It amazes us that in his Jackson Hole, Wyo. speech last August, and elsewhere as far as we know, Chairman Bernanke has emphasized the beneficiaries of low interest rates but never even mentioned the losers. Neither, to our knowledge, have any key Administration official or member of Congress. But near-zero interest rates are causing considerable distortions and outright harm to many. Think about savers who are receiving trivial returns on their bank and money market accounts (Chart 4) that would be negative if fund managers weren’t waiving fees. Furthermore, free checking accounts are fading. Banks and thrifts, facing low interest earnings, have increased the size of the required balance on checking accounts that pay no interest. Furthermore, many savers earlier deserted money market funds for the safety of FDIC-insured accounts. Will Americans be discouraged by low interest rate returns and save less, or will they save more to reach lifetime goals? I believe the latter, which is one more reason why I expect the household saving rate to climb back to double digits. At the same time, low interest returns in conjunction with distrust of stocks and previous huge losses on owner-occupied houses are forcing many vastly-undersaved postwar babies to work well beyond their expected retirements. With the Fed now intending to keep short-term interest rates near zero through 2015 – and probably longer as deleveraging keeps the economy subdued and unemployment high – what can savers do? Hope for the arrival of deflation, which will push real interest rates from negative to positive. We see lots of potentially “unsafe buildups.” Consider the rush into junk bonds, depressing their yields and spreads vs. Treasurys. 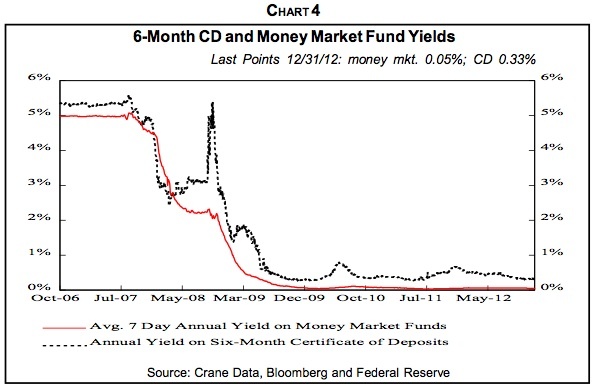 So much money has poured into below-investment grade debt that it’s taken real skill of late to default (Chart 5). So great is the investor zeal for yield that 46% of junk bonds are selling at or above the prices at which they can be called by the issuer. 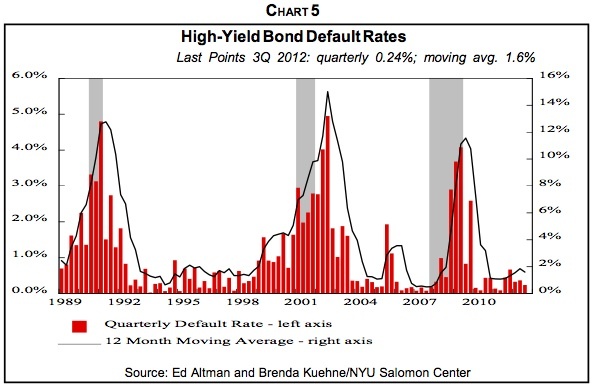 But a global recession will hype defaults even though many low-rated companies have a cushion of safety from prefunded debt. Relatively safer U.S. investment-grade corporate bond funds expanded their holdings by $131 billion, up from $75 billion in 2011, as yields dropped to a record low of 2.6%, but junk bond funds bought $30.1 billion compared to $13.8 billion in 2011. Yields on double-B bonds, the middle of the junk pile, fell from 6% at the start of 2012 to 4.5% at the end while their spread vs. 10-year Treasurys fell from four percentage points to 2.7%. And those top-quality Treasury notes returned only 2.8% last year while 30-year Treasury bonds had a total return of 1.7%. Yields even influenced stock selection with mutual fund investors putting $21 billion into dividend-paying funds while yanking $24 billion from U.S. stock funds in total. In another questionable maneuver to satisfy the zeal for yield, some managers of mutual bond funds are investing in riskier bonds, then comparing their results with their benchmarks, which are composed of safer bonds. This can be dangerous. In 2008, about 40 funds that had big holdings of mortgage-backed securities and derivatives outside their benchmarks lost 10% or more, according to Morningstar. There has also been a rush into emerging market bonds and stocks even though virtually all of those economies are driven by exports, the vast majority of which are bought by Europe, now clearly in recession, and the U.S., which may be soon. Just look at sliding Chinese export growth. Chronic low interest rates leave defined benefit pension plans, corporate and public, here and abroad, with tough choices. They need to reduce asset return targets and discount rates to more realistic levels, but that means more contributions and/or reduced benefits. Cutting pension benefits is always difficult, especially when restrained by public and private union contracts. The only other alternative is to increase returns, so pension plans have joined the zeal for yield crowd. And this often involves increased risks that may not be fully understood by those plan sponsors. The list of alternative investment classes includes real estate, private equity, developing country stocks and bonds, hedge funds and commodities. But returns, especially adjusted for risk, may be disappointing. At present, a Grand Disconnect exists between weak and declining economies, about which investors care little, and investors’ concentration instead on the immense liquidity being created by central banks. 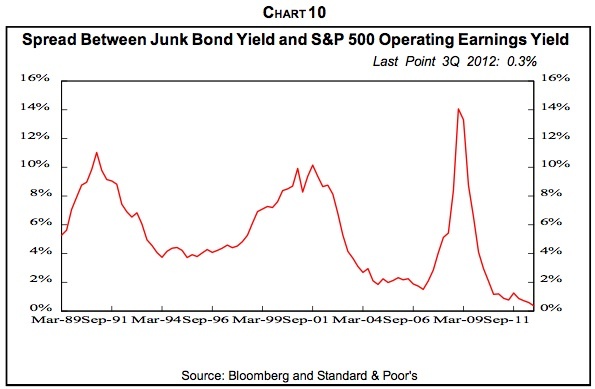 In addition, their zeal for yield favors the junkiest of the junk since risk is of no concern. In this climate, a “risk on” environment prevails and must be incorporated in any investment strategy. Nevertheless, we are very, very cautious because, as noted earlier, we don’t believe the Grand Disconnect is sustainable. When it is closed, probably by a significant shock, our strategy will shift to “risk off,” as we’ll discuss later. Let’s look at a few of the themes we believe will work in the current “risk on” investment environment. Please note that our themes that involve long equities are special niches like small luxuries and healthcare providers or defensive sectors like reliable dividend-payers and consumer staples and foods. In this uncertain investment climate, we won’t go so far as to advocate a wholesale plunge into stocks, junk bonds and other inherently high-risk investments. – Because the Fed and other central banks and foreign governments continue to buy huge quantities of Treasurys. Now only 23% of Treasurys are held by individual and institutional investors, down from 31% in 2002 and 55% in 1982. Foreigners, usually central banks, own 34%, up from 18% in 2002 and 13% in 1982, and the Fed owns 11% compared with half that share in 2008. 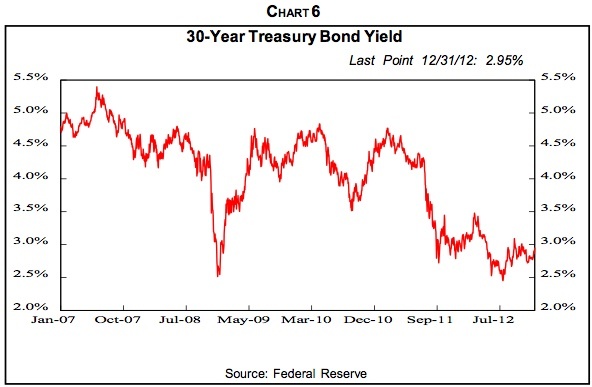 We’re now predicting a further decline in the 30-year Treasury bond yield from 2.9% at present to 2.0% (Chart 6). That further rate decline would produce a 23.7% total return in one year on a 30-year coupon Treasury including interest and 34.7% on a zero-coupon bond. We also expect the 10-year Treasury note yield to drop from the present 1.73% level to 1.0%, but the total return would only be 6.9%, largely due to its shorter maturity, and 7.5% on a 10-year zero-coupon note. In 1981, few agreed with us that serious inflation was unwinding and interest rates would fall. Indeed, the consensus called for rates to remain high or even rise indefinitely. Yet when 30-year Treasury yields peaked at 15.21% in October of that year, we stated that inflation was on the way out and “we’re entering the bond rally of a lifetime.” Later, we forecast a drop to a 3% yield. Again, most other forecasters thought we were crazy. The Dec. 17 Wall Street Journal reported that a poll of 21 primary bond dealers who deal directly with the Fed saw the 10-year Treasury note at the end if 2013 with a median yield of 2.25% vs. the 1.7% annual rate at the time of the poll. At the end of 2010, they forecast the median yield to be above the then-current 3.29% at the end of 2011, but it turned out to be 1.87%. Derivatives markets expect the yield on 10-year Treasurys to be 0.4% to 0.75% percentage points higher by 2015 and 1.5 points in five years. Most investors despise Treasury bonds, and not just because they fervently believe that serious inflation and leaping yields are inevitable. As we discussed in The Age of Deleveraging, stockholders inherently hate them. They say they don’t understand Treasury bonds. But their quality has been unquestioned, at least until recently, and their prices rose promptly in 2011 after S&P downgraded them. Treasurys and the forces that move yields are well-defined – Fed policy and inflation or deflation are among the few important factors. Stock prices, by contrast, are much more difficult to fathom. They depend on the business cycle, conditions in that particular industry, Congressional legislation, the quality of company management, merger and acquisition possibilities, corporate accounting, company pricing power, new and old product potentials, and myriad other variables. Stockholders do understand that Treasurys normally rally in weak economic conditions, which are negative for stock prices, so they consider declining Treasury yields to be a bad omen. Brokers also avoid recommending Treasurys since commissions on them are low, and investors can avoid commissions altogether by buying them directly from the Treasury. Wall Street denizens also disdain Treasurys, as I learned firsthand while at Merrill Lynch and then White, Weld years ago. Investment bankers didn’t want me along on client visits when I was forecasting lower interest rates. They wanted projections of higher rates that would encourage corporate clients to issue bonds immediately, not wait for lower rates and cheaper financing costs. Professional managers of bond funds are a sober bunch who perennially fret about inflation, higher yields, and subsequent losses on their portfolio. But if yields fall, they don’t rejoice over bond appreciation but worry about reinvesting their interest coupons and maturing bonds at lower yields. This disdain for bonds, especially Treasurys, persists despite their vastly superior performance vs. stocks since the early 1980s. Starting then, a 25-year zero-coupon Treasury, rolled into another 25-year annually to maintain the maturity, beat the S&P 500, on a total return basis, by 8.9 times (Chart 7). This is one of our very favorite charts since we have actually participated in this marvelous Treasury bond rally as forecasters, portfolio managers and investors. Some argue that in this example, we’re loading the deck by using 25-year zero Treasurys and not a mix with shorter maturities. In fact, however, we’ve been using those instruments in our portfolio for three decades. Furthermore, we argue that those who want to prove that stocks are superior to bonds over time often use the Barclays (formerly Lehman) U.S. aggregate fixed-income index with a duration of 5.07 years and an average maturity of 6.5 years, or the Barclays U.S. Treasury index with a duration of 5.44 years and average maturity of 6.6%. These are not bond indices. A Treasury Bond has a maturity of more than 10 years. From one year to 10 years, it’s a Note, and one year or less, a Bill. The Barclays indices have such short maturities and durations that contrary to 25- and 30-year bonds, and even more so zeros, they have very little appreciation as interest rates fall. Recall that we noted this earlier in comparing 10- and 30-year Treasurys. We’ve never, never, never bought Treasurys for their yield. We couldn’t care less what the yield is – as long as it’s going down! We want Treasurys for the same reason that most of today's stockholders want equities – appreciation. So we continued, “We don’t know why anyone would tie up money for infinity for a 2% yield.” We were putting the query, apples to apples, in the same framework as Professor Siegel’s rhetorical question. Last year, our index of companies involved in premium beer and liquors, perfumes, luxury clothing, jewelry, home products and handbags was up about 18% (Chart 8). Consumers, especially when they’re hard-pressed as many are now, tend to buy the very best of what they can afford, even if it’s within a low-priced category. 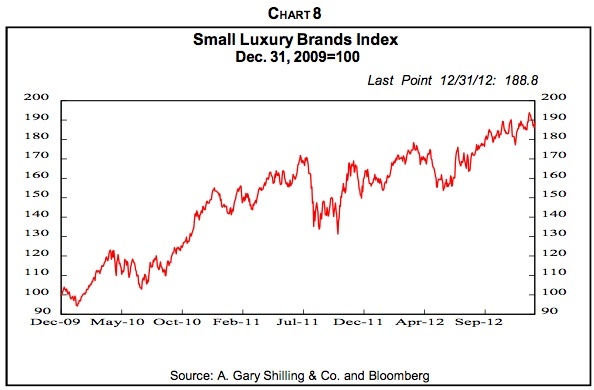 We developed this investment theme of small luxuries years ago when we noticed that tendency in apartheid South Africa. Urban blacks there often carried the elegant, slim, and expensive umbrellas typical of investment bankers in London. They couldn’t afford cars or even taxi fares, but they did achieve status and satisfaction with fine umbrellas. We think manufacturers and retailers that can adapt to the demand for small luxuries will continue to be winners in the current environment. Some are adopting the small luxury mode by offering essentially the same products at lower prices by cutting their manufacturing costs. Others don’t need big changes. The current Grand Disconnect is unsustainable, and unless global economies leap to match investor expectations, developed and developing country equities, junk and emerging market bonds, etc. will crash back to economic reality. The past and current massive monetary and fiscal stimuli or other forces would need to rekindle the substantial economic growth needed to drive up incomes and drive down unemployment. Some point to the recent rise in U.S. house prices as the beginning of such an economic revival. We doubt it, however. The massive deleveraging in private sectors here and abroad, the unresolved odd couple combination of the Teutonic North and the Club Med South in the eurozone and the needed shift in China from an export-led to a domestically-driven economy suggest that “risk on” investments will collapse to meet recessionary and chronically slow growing economies. What will cause the agonizing reappraisal by bullish investors? Probably a shock, as was the case in limited ways with the euphoria over QE1, QE2 and Operation Twist. 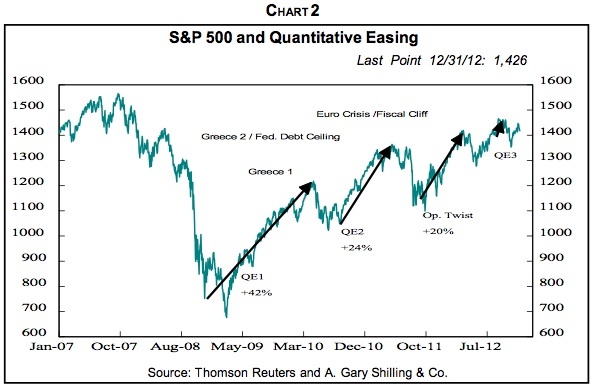 The first Greek debt crisis in early 2010 ended the QE1 stock rally. The QE2-spawned bull ended with Greece II and the widening European financial and economic woes in early 2011. Operation Twist optimism concluded with the realization that European problems may be unsolvable and with worries over the fiscal cliff in the U.S.
A sizable shock may provide investors with that realization. Forecasting specific jolts is hazardous, although we can list several possibilities, including a hard landing in China or an oil price leap, triggered by an Iran-related blow-up in the Middle East, or the failure of a major European bank or a U.S. recession, which would be a major shock to bullish investors, especially since so many believe the American economy is on the mend. As discussed earlier, a shock and global recession that ends the Grand Disconnect and re-establishes a "risk off" investment strategy would benefit the dollar and reassert the greenback as the world’s major reserve and trading currency, and safe haven. Commodity currencies like the Canadian, New Zealand and Australian dollars as well as the Brazilian real would suffer as commodity demand and prices continue to fall. The yen is losing its safe haven status as the new Abe government systematically strives to depress its value, and would continue to drop. The euro has rallied against the buck in recent months (Chart 9) as the latest Greek bailout materializes and currency traders worried about the U.S. fiscal cliff. With both of those crises out of the way, at least temporarily, emphasis may well shift back to the unsolved and probably unsolvable problems in the eurozone. Deleveraging, low interest rates and a global recession would plague major U.S. banks and financial service institutions in a risk off environment. European banks are in much worse shape, plagued by their subprime sovereign debt holdings and bad loans. If a shock closes the Grand Disconnect this year, investors will learn the hard way that their neglect for risk in pursuing their zeal for yield was a big mistake. Junk bonds may be a prime example even though they rose 16% in price last year as their yields and spreads vs. Treasurys dropped. Investor zeal made refinancing sub-investment-grade securities easy, so defaults were also near record lows. 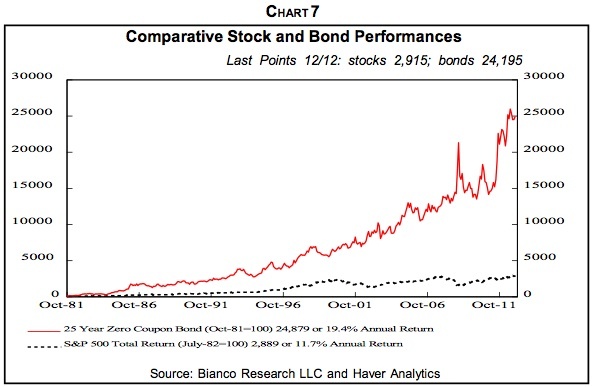 The stampede into junk bonds has been so massive that the spread between the yield on junk bonds and the earnings yield on stocks is close to zero (Chart 10). Earlier refinancings have provided some cushion for low-rated companies against the hard reality of the global recession we expect this year. Nevertheless, we believe default rates will rise from unsustainably low levels and the prices of junk bonds, leveraged loans and other low-rated securities will retreat. 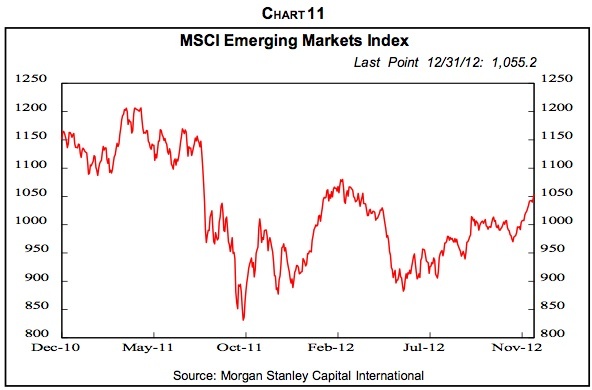 The MSCI Emerging Market Stock Index rose 15% (Chart 11) in 2012. Nevertheless, substantial weakness is likely this year for two distinct reasons. First, as noted earlier, the hard landing in China, the result of government policy restraint there and flagging exports, will knock growth back to 5% to 6% recessionary rates, as China suffered in early 2009. The effects will spread widely from the world’s second largest economy and major commodity importer. Second, the deepening recession in Europe, hard landing in China and economic downturn in the U.S. will spawn global economic retreat to the extreme detriment of commodity and other export-dependent developing economies. The reality of their close coupling to the U.S. and Europe will probably be painfully obvious this year. Weakness in major country stock markets is the logical consequence of the deepening recession in the eurozone and renewed downturn in the U.K., a hard landing in China, the unfolding recession in Japan, and moderate downturn in the U.S., culminating in a global economic downturn with possible negative financial implications. Reinforcing this likelihood is our belief that the U.S. and other developed economies are in a secular downswing that started in 2000, which is accompanied by a secular bear market in equities. These periods of more frequent, deeper recessions are mirrored by more frequent deeper cyclical bear markets in stocks. 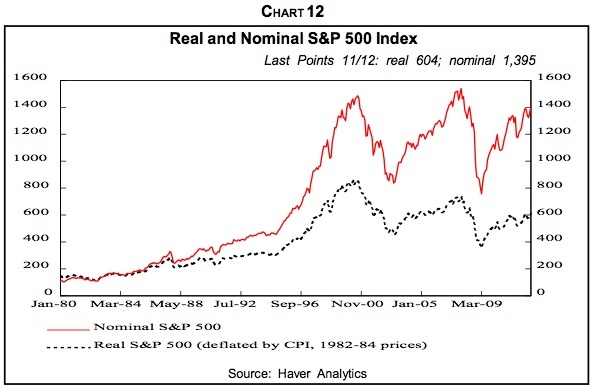 Since the peak in 2000, the S&P 500 index in real terms is down 30% (Chart 12). Our friend Prof. Robert Shiller of Yale also finds that the S&P 500 P/E is vulnerable at present by averaging earnings over the last 10 years to iron out cyclical fluctuations. By his measure, the P/E in Dec. 2012, 21.6, was 31% above the long-term average of 16.5, suggesting a substantial decline in stock prices as the P/E reverts to its mean – except in the unlikely event that corporate earnings spurt this year. And note that since that P/E has spent so much time above the average in recent years, it’s likely to be subpar for some time. We estimate that S&P 500 operating earnings will be $80 this year and that the P/E will drop to 13 in the global recessionary climate, about the average in past bear markets, and the S&P 500 index would fall to 1,040, a 27% decline from its 1,426 level at the end of 2012. Other major stock markets should show similar weakness, replacing the euphoria of the Grand Disconnect. Few agree with these forecasts. Bottom-up Wall Street analysts, who estimate earnings company-by-company and are congenitally optimistic since they want to please the managements of the companies they follow, see 2013 S&P 500 operating earnings at $112.19, a 12.9% jump from the $99.37 they expect for 2012. More sober top-down strategists expect a 7.7% rise from $99.54 to $107.20. And most Wall Street wizards believe the current P/E is on the low side, suggesting even more robust expectations for stock prices. Interestingly, a year ago the bottom-up analysts expected 2012 operating earnings to be $106.81, 7.5% higher than now while top-down strategists saw $105.38, 5.9% above their current estimates for 2012. In a climate of global stock market declines, there are few trend buckers, as mentioned earlier. Consequently, in shifting from our Pre-Shock ("Risk On") Investment Themes to our Post-Shock ("Risk Off") list, we’ve eliminated most of our long stock suggestions. That includes dividend-heavy stocks in the Selected Income-Producing Securities category, Consumer Staples and Foods, Health Care Provider equities, Productivity Enhancers and North American Energy Producer equities, although we still favor natural gas in commodity form. We’ve retained Medical Office Buildings but in the form of direct investments, not REITs, which appear vulnerable. Ditto for direct ownership of rental apartments, not via REITs. The only long equity theme we retain is Small Luxuries, which may have enough appeal to stressed consumers in tough times that these stocks overcome general stock market weakness. Was Your Stock Portfolio Up Over 40% in 2013?